Allan Young and I have just published the first-ever attempt to track down all surviving copies of Burns’s first book, Poems, Chiefly in the Scottish Dialect (Kilmarnock: Wilson, 1786), the Kilmarnock Burns.1 Mr Young started working on this project fifteen years ago, and I have been collaborating with him for the past two years. We located just eighty-four surviving copies, which makes Burns’s book three times rarer than the Shakespeare First Folio. Yet one of the big recent shifts in literary studies has been the growing interest in ‘book history’, and in the material forms in which we encounter literary texts. Mr. Young and I were not just listing the eighty-four copies, but trying to describe them and track their stories. After 230 years, the ravages of time and the pride of former owners have left marks on each surviving copy. Many copies carry ownership inscriptions, annotations, or bookplates. Some include manuscript poems, a few in Burns’s hand. Successive bindings and re-bindings mean that the copies vary quite a bit in size. Some have tears or missing leaves, and even after repair and replacement, most restoration leaves detectable traces. The accumulative of such changes makes every copy distinctive, and through reading these differences one can reconstruct changing attitudes to this book, and to Burns himself. 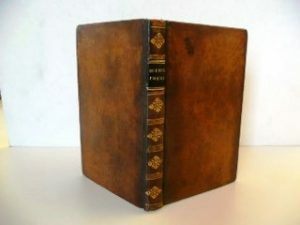 Such bindings were not only a statement about the importance of Burns, but also of the owner’s wealth and status, and the best examples are collectible in their own right: indeed, most copies in fine bindings were housed in their own protective morocco slip cases or boxes that to the casual eye look equally impressive. By 1900, Burns was not only a prestige author, but an international one. Both buyers and prices had changed: instead of an Ayrshire farmer the typical early twentieth-century Kilmarnock purchaser might be a Scottish peer or an American railroad baron. Burns’s original subscribers had paid just 3 shillings (15p), but in 1929 a copy sold at auction for £2,550 (£140,000 at current value). In 2017, while there are still six copies in Ayrshire, and twenty-five in Scotland, there are at least forty-eight in the United States. The contrast seems obvious enough. A Kilmarnock as originally issued was all of a piece with hodden gray, hamely fare, and a’ that. The Kilmarnock as later collected was a precious icon of world literature. Relatively few of the later collectors aimed to build a comprehensive collection of Burns editions. Most of them were adding a Kilmarnock alongside other Great Books. Indeed, part of its prestige in the market was its inclusion in One Hundred Books Famous in English Literature, a collector-list published in 1902 by the Grolier Club of New York. On the other side, even in the 1890s and early 1900s, many individual Kilmarnock owners on both sides of the Atlantic have not been people of great wealth. Duncan M’Naught, longtime editor of the Burns Chronicle, was parish schoolmaster of Kilmaurs, but owned two Kilmarnocks. One of the most famous wrappered Kilmarnocks was owned in the 1890s by A. C. Lamb, proprietor of a temperance hotel in Dundee. By 1900, too, many copies had become tatty, and the elaborate bindings played an important role in their survival. 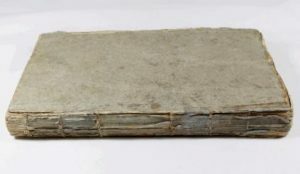 Unlike the Shakespeare First Folio, the Kilmarnock Burns is a thin volume that, in an undistinguished early binding or in bad condition, could well be overlooked when an owner dies or a house is cleared. Part C of our book contains several anecdotes of this kind. It was not till the collector generation that the special importance of the surviving wrappered copies was recognized, and the competition between collectors who couldn’t get one put a special premium on other copies with early inscriptions or manuscript material. 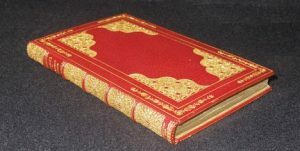 Once a Burns manuscript had been bound up with a Kilmarnock in red morocco gilt, its survival was ensured. It was many years later before university libraries and other public institutions took over this role to any significant extent. Two centuries later, the importance of Burns’s own poems means that all Kilmarnocks, whatever their binding, can be of great research interest as well as of monetary value. Even a copy that is damaged or imperfect tells a story. 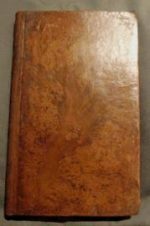 It is often through the material form in which Burns’s first book has survived, in the ambitious ‘improvements’ made by earlier owners and in the traces of neglect or mishandling, that we can now reconstruct the varied ways in which Burns has been valued. Allan Young and Patrick Scott, The Kilmarnock Burns: A Census (Columbia, SC: University of South Carolina Libraries, 2017). The discussion here draws from my introductory essay, ‘Describing the Kilmarnock’, pp. xxi-xxxvi, which gives fuller references. Aberdeen Journal, July 29, 1903, p. 10. G. Ross Roy, in Burns Chronicle Homecoming 2009, ed. Peter J. Westwood (Dumfries: Burns Federation, 2010), p. 415.
Letters of Robert Burns, ed. G. Ross Roy (Oxford: Clarendon, 1985), I: 50. Richard Sher, The Enlightenment and the Book: Scottish Authors & Their Publishers in Eighteenth-Century Britain, Ireland, & America (Chicago: University of Chicago Press, 2006), p. 230. The exchange is reprinted in Donald A. Low, ed., Robert Burns: the Critical Heritage (London: Routledge, Kegan Paul, 1974), pp. 65-66. Poems and Songs, ed. James Kinsley (Oxford: Clarendon Press, 1968), II: 906. Patrick Scott is Research Fellow for Scottish Collections and Distinguished Professor Emeritus in the Department of English Language and Literature at the University of South Carolina.